The kiddos are in school, the heat index is dropping and pumpkin flavored drinks are on everyone’s mind. Labor Day weekend has come and gone and fall is almost officially here.Although summer 2013 is rapidly coming to an end, you can still use up your vacation days and enjoy a week at the beach for less. 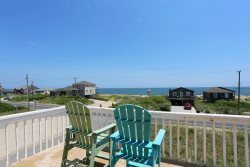 There are plenty of reasons to visit the Outer Banks after Labor Day including great deals on Outer Banks vacation rentals. Vacation rental site Flipkey performed an analysis of just how much you can expect to save if you plan your beach vacation after Labor Day and guess what east coast hot spot made the top of the list? The analysis found that the greatest price drops from August to September are on lodging in the Outer Banks of North Carolina. Average daily lodging rates fall from $390 a night to $195, a 50% savings!We decided to perform our own analysis on two of our Nags Head rentals and here is what we found: We have a six bedroom oceanfront home in Nags Head that rents for $1,895 during the last week of September. The same house rents for $6,200 during a mid-July week. That’s a 70% savings ! Our second price comparison home is a five bedroom beauty located between the roads in Nags Head. The house rents for $1,395 during mid-September and $3,495 during mid-July…. 60% off! In addition to saving a bundle on Outer Banks rentals, you may also have a better beach vacation in September as opposed to July.Water temperatures remain close to their yearly highs and during September with average ocean temps right around 77°F. You can also take advantage of less traffic, shorter waits at popular local restaurants, better surfing conditions and of course spectacular fishing.